In this final part of the Know Your Lights series, I’m taking a look at some of the LED fixtures currently available. In this frame from Ren: The Girl with the Mark, Hunter’s face is lit by a small LED reporter light hidden behind the bucket to suggest a reflection off the water. LEDs (light emitting diodes) generate light through electroluminescence. When a controlled direct current is applied to the electrodes, electrons in the semi-conductor reconfigure, releasing energy as light. LEDs have been around since the early sixties, but for decades they were only capable of emitting a weak red glow, restricting their applications to things like TV standby lights and digital clocks. In recent years the brightness and colour range of LEDs has improved dramatically, making them practical alternatives to traditional light sources. Compared with those sources – tungsten, HMI and fluorescent – LEDs are more efficient, lighter, generate less heat, have a longer life, and are less likely to break and less dangerous when they do. They are fully dimmable, without the colour temperature changing, but if you wish, some fixtures allow you to alter the colour temperature with the turn of a knob. On the down side, LED units are expensive, lack the raw power of large HMI or tungsten fixtures, and can often suffer from poor CRI (colour rendering index – see the overview for more info). The technology is improving rapidly, and LEDs will only get better over the coming years. For now, many regard them as speciality lights, and they are almost always outnumbered by tungsten, HMI and fluorescent units in a drama lighting package. But some productions have really embraced them, an example being Guardians of the Galaxy, where many of the colourful practicals built into the sets were LEDs. Because they can be squeezed into smaller spaces than any other kind of light, and because you can get around the poor CRI by using coloured lamps, or gelling white ones, LEDs are well suited to creating practical glows from computers, control desks and other technology. 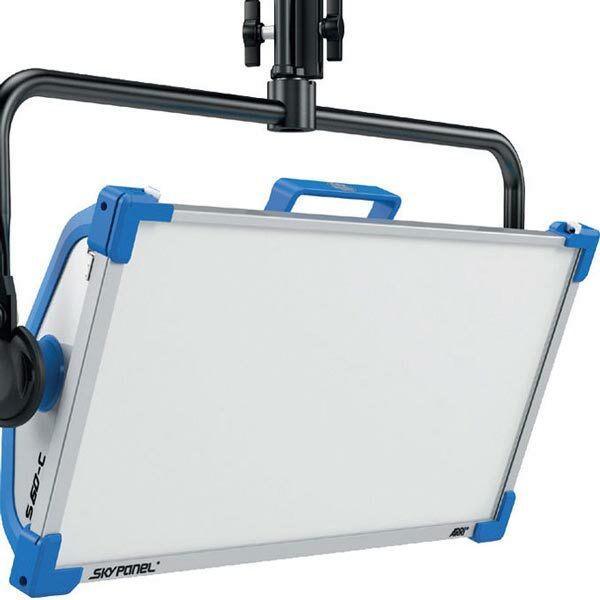 1’x1′ LitePanels are perhaps the most common LED unit. These panels have two dials on the back: one for brightness, and one for colour temperature (3200-5600K). They can be run off mains or a V-lock battery, drawing 40W to output about as much light as a 200W HMI. 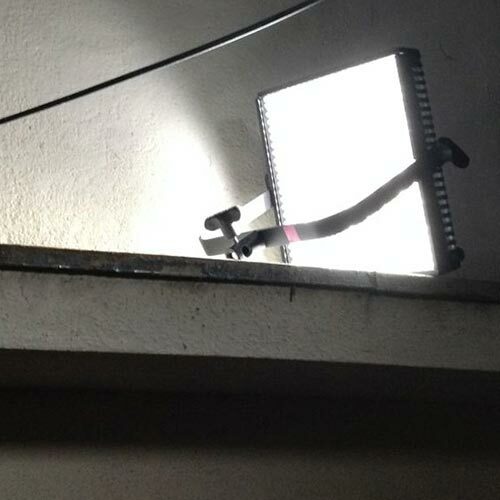 LP-1×1 LitePanel, set up in seconds on a lintel in a street location in Japan for the sci-fi thriller Synced. As you are about to roll, you spot an area of the frame that needs a little extra splash of light. It is the work of moments to slap a battery on a LitePanel and fly it into shot. A light needs to be situated in a tight space in the set, or in a spot which a power cable couldn’t reach without appearing in frame, or both. The fact that you can just prop these panels up against the set without worrying about them getting hot and damaging something is huge. When required to shoot a night exterior without a generator, LED panels can really help you out. Even if you do have a genny, the ability to set up a source without running power to it is extremely useful. A short film I shot called Forever Alone is a good example. Wrapped in a diffuser like tough-spun or muslin, they make good fill lights or eye lights for day exterior close-ups. They can make good TV sources, particularly if your set-up time is limited. A spark can twiddle the brightness and colour temp dials during takes to simulate changing images on the TV screen. There are many manufacturers producing panels in 1’x1′ and other sizes, but LitePanels are the best ones I’ve encountered. However, I’ve yet to come across any LED unit with a good enough CRI to use as a key light. 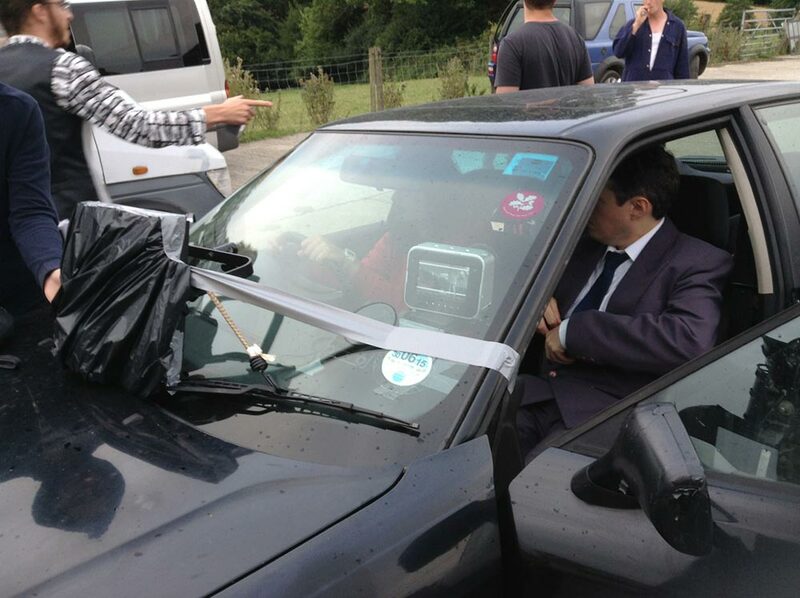 Under the black bag is an LP-1×1 LitePanel to keep some consistency to the light on the actors as the car moves, in this scene from The Gong Fu Connection. A range I haven’t used is the Arri SkyPanels. Designed primarily to be rigged overhead from studio grids, they come in 30, 60 and 120cm lengths. The coolest thing about these units is that you don’t need to gel them; just punch in the Lee or Rosco code of the gel you want to use, and the light instantly changes colour! Rosco Lite Pads go for a slightly different approach. The LEDs are arranged around the edges of these panels, and bounce off the white backing to produce a soft daylight source. They’re not very bright, and again the CRI is not great, but the range of shapes and sizes they come in mean that you can find one to fit most tricky spaces. I used these a lot on Above the Clouds (check out the blog posts) in many different situations. 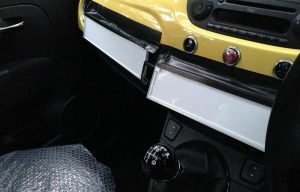 Two 3″x12″ Lite Pads saw extensive use as fill/eye light, taped to the dashboard of a Fiat 500 in driving scenes. The other standard sizes are 3″x6″, 6″x6″, 6″x12″, 12″x12″ and 3″ circular. The panels themselves are stripped down, so batteries and dimmers can be sited remotely. 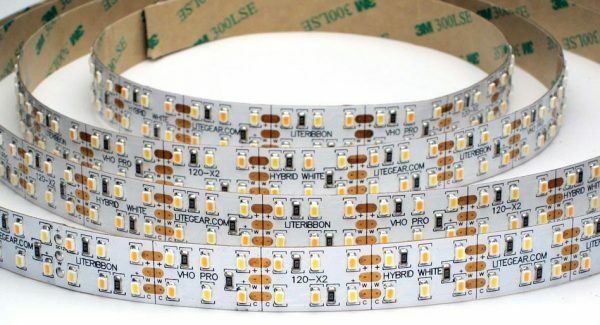 Rosco also makes LitePad Vectors, which are more like other brands of LED panel, with on-board dimmers and increased light output, and they can even make custom LitePads. Several companies make small fresnels which at first glance appear to be HMIs, but are in fact LEDs. 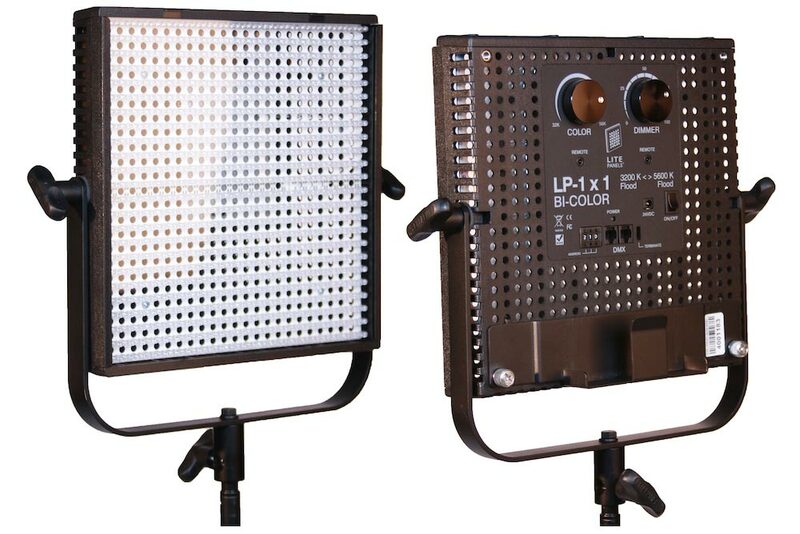 LitePanels make the Sola 6C and Sola ENG, equivalent to 200 and 100W HMIs respectively. 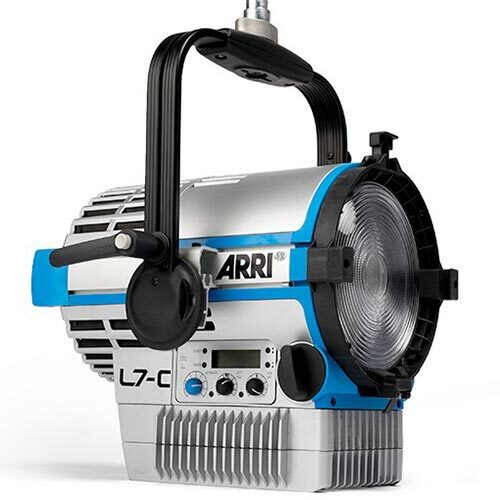 Arri makes the L5, L7 and L10 units, which are each available in three models with differing brightness and colour-tuneability characteristics. The brightest L10 models are comparable with a 2K tungsten fresnel, while drawing a fifth of the power. There are budget models out there too, such as the NiceFoto CE-1500Ws, which I used a little on Ren: The Girl with the Mark. As with all budget LED and fluorescent lights, the CRI is very poor, but it was useful when we lacked enough traditional fixtures. Overall, LED fresnels are currently most relevant in scenarios where power is very limited, or portability and lack of heat is particularly important – in a nutshell, electronic news-gathering (ENG). The Enterprise bridge set featured in the last three Star Trek movies has all its control panels lit by LiteRibbons. Mad Max: Fury Road, and many other movies with driving scenes, had strips of LEDs mounted to the ceiling, window frames and pillars of the truck cab to increase the exposure inside. The mini reactor that powers Iron Man’s suit is illuminated by LiteRibbon LEDs. Some predict that, as LEDs get brighter, cheaper and higher in CRI, they will eventually replace every other kind of lighting. For now though, they’re just another part of the toolkit in which tungsten and HMIs, and to a lesser extent fluorescents, are the go-to tools. There is a fifth type of lighting that is emerging too: plasma lighting, but it’s so new and so rare at the moment that I don’t feel equipped to write a post about it yet. But you can read about it over on Shane Hurlbut’s blog. Another great blog to teach you about the many lights out there is Set Lighting, written by experienced Hollywood gaffer Martijn Veltman. His site was really useful when I was researching this series. Of course, the most important thing is not what lights you have, but how you use them. There are many, many posts here on neiloseman.com to teach you about that. Check out the Lighting Techniques series for some basics, watch my Lensing Ren video series to see how all four types of lighting are used in practice on a real shoot, or simply search the tag ‘lighting’ for a wealth of material. This article originated at www.neiloseman.com . Check out Neil's other cinematographic articles there. I'm a director of photography with 18 years' industry experience. My recent feature credits include The Little Mermaid (starring Shirley MacLaine), Heretiks (starring Clare "Hellraiser" Higgins) and additional photography on The Etruscan Smile with Brian Cox. In 2016 I was awarded Best Cinematography at Festigious International Film Festival for my work on the short drama Night Owls. Second only to my love of cinematography is my passion for sharing what I learn, which I do through my blog and my Instagram feed.